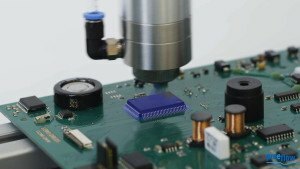 In general: Conformal coating applications for example concerning electrical parts helps to extend product service life of single components in different industry branches. Generally protection paint preserves electrical parts, like printed circuit boards from moisture, contaminations like dust, chemicals and temperature fluctuations. Furthermore the coating can improve system stability and electrical characteristic values. The positive properties of conformal coating material result predominantly in applications in electronic industry, as well as in the military sector or aerospace. The spraying of conformal coating material as new preeflow application field. For precise applications of conformal coating material for example to single parts of electrical components, the brand-new since February 2016 available spray dispenser eco-SPRAY of preeflow will be recommended. The combination of the reliable endless piston principle and a low-flow spray chamber revolutionizes existing spray dispenser systems. The advantages of volumetric dispensing in spraying sector are essential. The volume to be nebulized can be precisely defined and exactly applied. A variation in volume rate can directly and proportionately affect the spray-image. Consequently the spray width can practically be changed “on the fly” during operation therefore dynamically. A selection of dosing needles and air shutters are included in delivery of the eco-SPRAY, which can be changed extremely uncomplicated and fast during persisting setup. With this hands-on needle and/or air shutter change an ideal adjustment to medium and dosing process can be achieved within short-time. The system is showing supreme flexibility with this outstanding possibility to change a core component for precision in a simple manner. Besides an uniform spray-image with incomparable high edge definition can be generated. Viscosity- and back-pressure independent spraying is allowing the system to apply a constant amount to a defined area. Preeflow provides with a typical material an example to what a nebulization of conformal coating should look like, having a viscosity of 20 mPas and a density of about 1 g/cm3. The controllable round spray is suitable for continuous as well as punctual application. All parameters, like spraying air, diameter of the dosing needle and air shutter can easily be adjusted. These values directly influence spray-image, spray-width and layer thickness. Robot speed and the changes in volume rate exert directly influence on layer thickness. Homogenous coatings with a width of 5 to 25 mm and a thickness from 3 µm on can be reached. Feedbacks to the results of the eco-SPRAY application from specialists of the leading manufacturers of conformal coating materials were without exception enthusiastic. Especially precise edge definition, but also homogeneous application of a plain coating despite fine layer thickness persuaded the experts. Additionally the viscosity independent application and high chemical resistance for varying applications and materials make the eco-SPRAY the perfect spray solution.